Restored Horizons POV Ride Through Video - Amazing Quality! Video Restored Horizons POV Ride Through Video - Amazing Quality! This is the first video restoration that we are releasing (we released some film restorations two weeks ago)...We couldn't think of a better attraction to start with other than Horizons! Martin Smith, whom you all know from his Ultimate Tributes (www.martinsvids.net) was kind enough to send me this footage from June 1990 for enhancement/restoration. 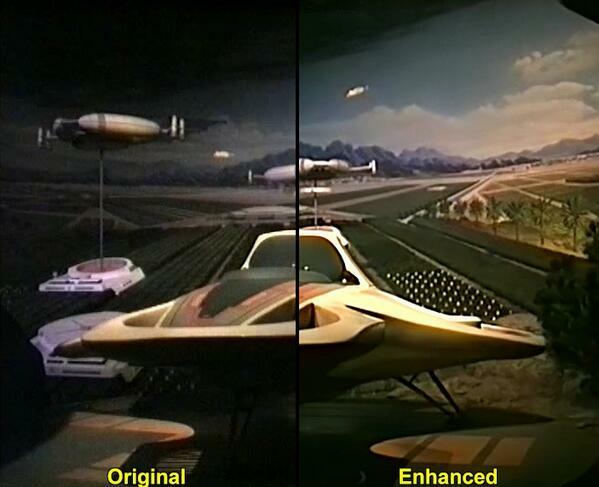 Re: Restored Horizons POV Ride Through Video - Amazing Quality! Very nice. Just hearing the first couple of sounds took me back there! I so miss that attraction! Very cool, I loved this ride. I had forgotten how long it was ! Great restoration job ! Very nice. I still like Martin Smith's Ultimate Tribute video better though. Still hard to believe Disney demolished this thing into a little cube and replaced it with a dumb whirl-n-hurl disguised as a high-tech attraction. What's even worse is that it was all new technology and one of the most advanced ride systems ever created with a cost of over $100M and it still wasn't very interesting. Rode it once, it was OK. Rode it the second time, was bored. And done. Meanwhile, I could ride the original Journey Into Imagination, World of Motion, Horizons, or Spaceship Earth about a thousand times. Money and technology can not replace creativity, charm, and wonder.